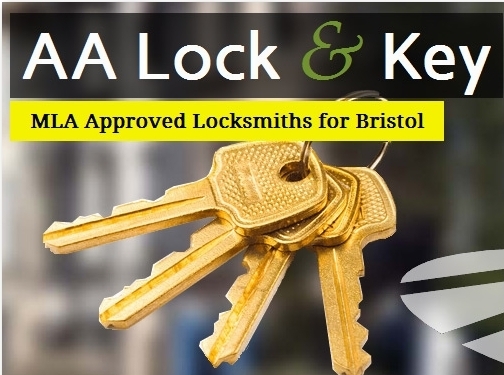 AA Lock and Key are genuinely located in Bristol, providing a 24hr mobile emergency locksmith service, normally with you in 30 minutes or at a time to suit you. All staff are approved by the Master Locksmith"s Association and CRB checked for your added security and assurance. Popular locksmith services include: providing lock opening, lock fitting, lock repairs and locks changed but not limited to. Popular lock brands for securing homes in Bristol include: Asec, Yale, Chubb, Union, Era and Mul-T- Lock. When calling AA Lock and Key you will speak directly with a qualified locksmith who will be able to accurately quote for works required and recommend the best products for application. UK (Downend, Bristol) based business - established in 2009 - providing locksmith services. Website includes details of services provided, testimonials, associations belonged to, details of CRB check, full contact details. Company website has been online since 2014 according to web.archive.org.